TRUE ski-in & ski-out appartement met 2 slaapkamers! Direct aan de skipiste! Gewoon cruise over 250 meter naar de wizard High Speed ​​Quad stoel bij Whistler Blackcomb Base. Volledig ingerichte keuken; In-suite kleding wasmachine en droger. 50-eenheid gezinsgericht gebouw. * Ruime 1.025 m² Condo - casual elegantie met een open haard en uitzicht op de bergen, met uitzicht op zwembad, binnenplaats en gemeenschappelijke BBQ. AC in de zomermaanden. * Volledig ingerichte keuken - fornuis, koelkast, vaatwasser, magnetron, servies, bestek, kookgerei, koffiepot, broodrooster, crock pot, blender, enz. Sleutelwoorden: ruime ski-in / ski-out -1025 sq ft op een verdieping, volledig uitgeruste keuken, gas open haard, in-unit wasmachine en droger, grote Mt. uitzichten, gratis bewaakte parkeerplaats, lift, receptie, 50-eengezinswoning, groot verwarmd zwembad, 2 bubbelbaden, gratis breedbandinternet, 3TV's, balkon met uitzicht op het zwembad, gratis pendelbus naar het dorp Whistler of 10 minuten lopen. Like home for seasons after seasons! Been staying at this Greystone unit for at least 15 winter season trips! Well-furnished, convenient, great owners. Something must be right with this place if I'm already planning for next year after returning from this year's trip only a week ago. Visited the area for a guys ski week. The condo was nicely appointed and with the bed configuration all four of us had our own bed which was hard to come by in a 2Bed/2Bath unit. It is a little farther away from the main village but was great for us. The building itself was quiet with both an indoor and outdoor pool-hot tub set up. Having a washer/dryer in the unit was also a great to clean clothes and just dry out gear after a day on the hill. It was just an easy walk to the ski run and a short ride down to the new Blackcomb gondola. Convenient underground parking. Only two suggestions - new pans - the frying pans in the kitchen (non-stick) were impossible to keep things from sticking to the pan and we cooked in breakfast all week. The other thing was the long access code touch key pad to get in an out of the unit but after a couple of days we had it down. Hi. Thank you for the feedback and the heads up regarding the fry pans! We will make sure they are replaced this month. And the passcodes are the unit door number plus a personalized 6 digit number that is automatically generated by our lock company. The benefit is that you never forget which unit is yours! Hope to host you and your party again! Take care. Location allowed us to easily get on and off the slopes. We were also able to use the slopes to get into the village without having to rely on the shuttle very much. Condo was very nice and met all of our needs, the washer/dryer was very helpful. Location is everything when skiing ! 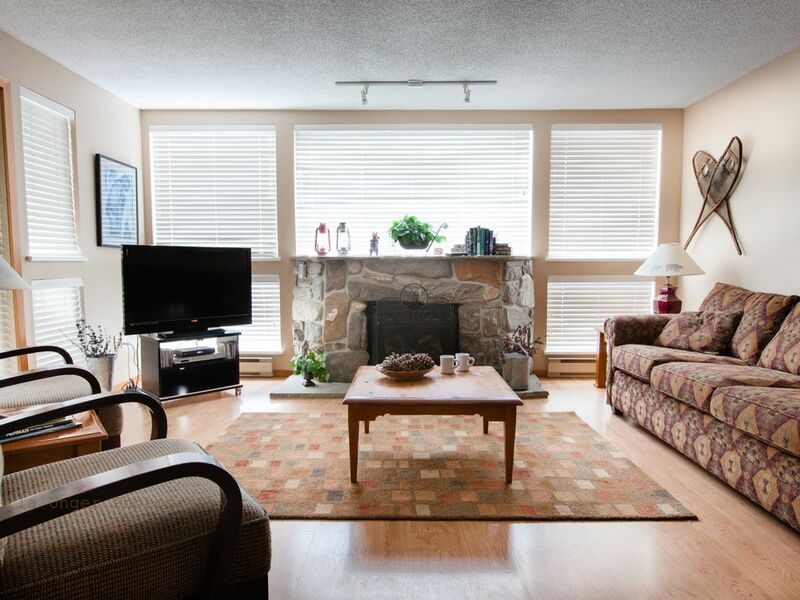 The condo is pretty basic but has everything you need if you’re there to ski which we were! Very nice and very conveniently located condo. Great location with true ski in/ski out on the Blackcomb side, easy walk to Blackcomb village and Whistler village not much further. Enjoyed the well equipped condo (kitchen, laundry) pool and hot tub. Family of five with 3 adult children had a wonderful time. The owners could not have been more welcoming and helpful! We've stayed in the Greystone many times and this was a good unit. Well equipped with homely touches, it was perfect for our needs. No snow to ski out on this year but that's the risk with Thanksgiving. If you are looking for an Upper Village place, this is a good choice. Thanks Ray for your review! Glad that you and your family enjoyed your stay. Come back for a visit anytime.